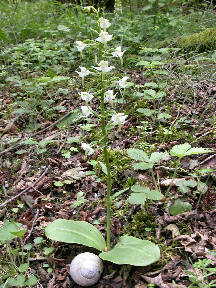 The easiest way to tell the two platanthera apart is the number of leaves: bifolia has 2 leaves, chlorantha has several. 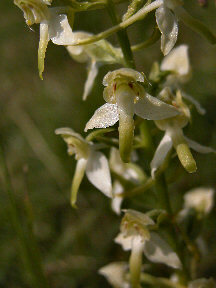 These orchids grow in dry meadows or on the edges of woods in acidic or calciferous soil soil. 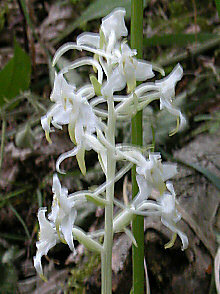 This is a true albino - even the stem is white. 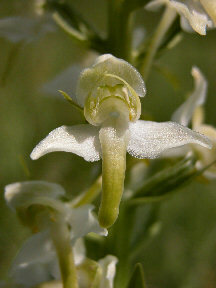 Unfortunately it was a windy day and the photo is bit blurred. 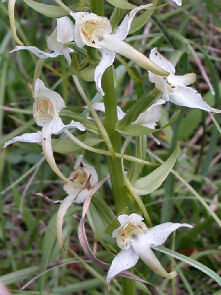 These orchids grow in dry meadows and open woods, primarily in calciferous soil. 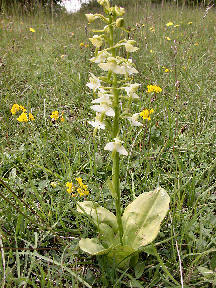 The lower end of the lip is greener than that of platanthera bifolia but this is very difficult to see unless the two plants are side by side.